Orlando, FL (November 20, 2018): David Weekley Homes, the nation’s largest privately-held builder, was presented with two awards recognizing the Largest Philanthropic Companies at the 2018 Orlando Business Journal Corporate Philanthropy Awards on Friday, November 16. David Weekley Homes received an honor for team member volunteer hours, as well as a recognition for philanthropic donations to local nonprofits. The company partners with organizations throughout the year for CARE projects, such as collecting items and assembling care packages for USO Central Florida, donating and cooking dinners through the Ronald McDonald House Charities® of Central Florida Share-a-Meal program, building ramps for Center for Independent Living, collecting school supplies for A Gift For Teaching and hosting a Thanksgiving drive to gather nonperishables and turkeys for Second Harvest Food Bank of Central Florida. David Weekley’s efforts in the community are initiatives of the company’s CARE program, which is a charitable and volunteer program that joins team members, homeowners, homebuyers and community partners with nonprofits to make a positive impact in the lives of everyone it touches and in all the communities it builds through its purpose, Building Dreams, Enhancing Lives. This is accomplished by company team members volunteering countless hours to different organizations in their communities and by The David Weekley Family Foundation donating more than $200 million to a variety of organizations through the U.S. and abroad over the past 20 years. A – Active in our Community… engaging our communities through team members completing hundreds of projects and The David Weekley Family Foundation donating more than $200 million to worthy causes over the past 20 years. For more information about David Weekley Homes in Orlando, contact 407-478-5933. David Weekley Homes, founded in 1976, is headquartered in Houston and operates in 21 cities across the United States. David Weekley Homes was the first builder in the United States to be awarded the Triple Crown of American Home Building, an honor which includes “America’s Best Builder,” “National Housing Quality Award” and “National Builder of the Year.” Weekley has also appeared 12 times on FORTUNE magazine’s “100 Best Companies to Work For®” list. Since inception, David Weekley Homes has closed more than 90,000 homes. For more information about David Weekley Homes, visit the company’s website at www.davidweekleyhomes.com. 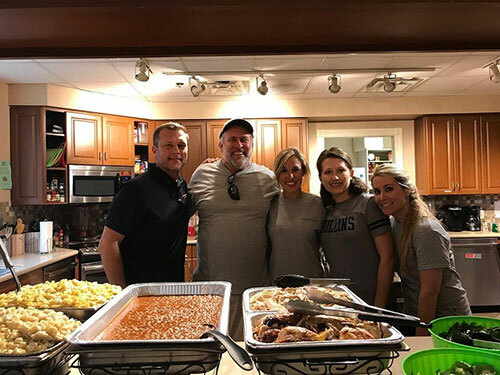 David Weekley Homes team members volunteer with the Share-a-Meal program at Ronald McDonald House Charities® of Central Florida.